If you run an IT Company or technology related business it is essential that you have a modern and well designed website to show off your service to potential customers. If you are offering tech services and have an outdated, slow or non-responsive websites it could cost you business as these types of customers are tech savvy and will be put off by this. Luckily, WordPress is a great platform to build your company website and coupled with the right WordPress theme you can have a beautiful web presence that wont break the bank. What makes WordPress so good for business websites is the fact that it has most of the tools you will need right out of the box. It will allow you to create pages, blog posts and add images and image galleries and any extra functionality you will need can be added via the use of plugins. So you can add contact forms, social media links, sliders, booking forms, calendars and so on with a couple of clicks and you will find that there is a free plugin to cover most of your needs. WordPress also has an easy learning curve which means its great for beginners to use to put together their own sites, rather than having to hire expensive development firms. All you really need is some good web hosting to ensure your sites home online is secure, a free copy of WordPress and a little time to get to learn the ropes. 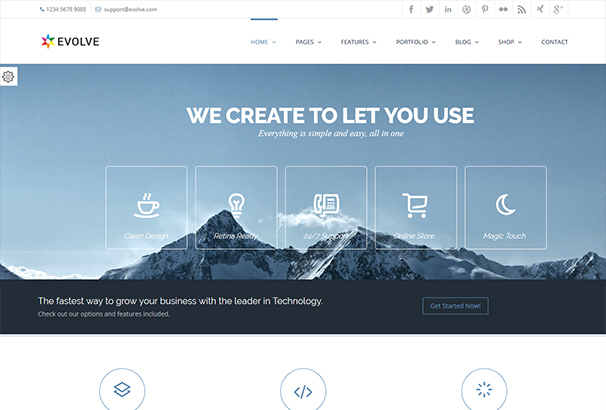 In this collection we have collected all the Best IT Company and Technology Business related WordPress themes for you. These all have a corporate feel with modern designs, tidy coding, fast loading and are optimized to look good on all size screens from Desktop displays to mobile devices. 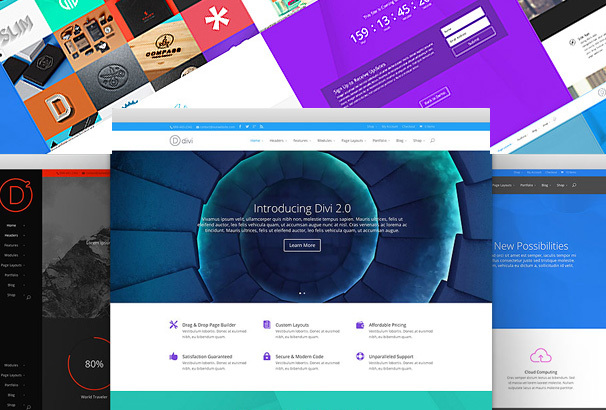 Divi is an extremely powerful theme which is more of a complete framework designed and built by Elegant Themes. It’s main feature is the Divi builder which lets you create page layouts visually using a drag and drop page builder so can create unique layouts without touching any code, perfect for novice users and experienced developers alike. Divi is perfect for building all kinds of corporate and business websites so it is perfect for IT and Technology related companies. You have the choice of lots of pre-designed elements, custom headers, footers and page elements. 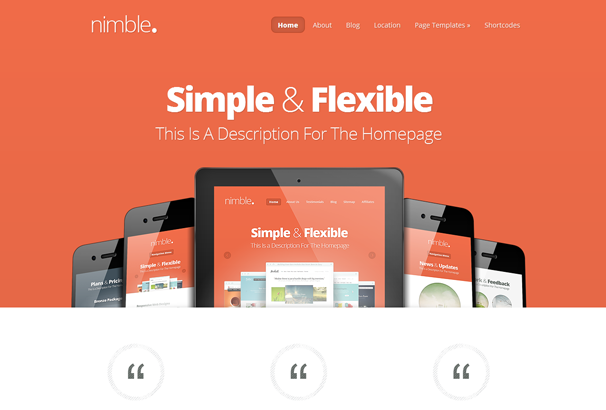 Nimble is a really bold and dynamic website theme which really makes a statement with its design. Although its colour scheme and design is really powerful, it does not get in the way of Nimble’s functionality and efficiency. The perfect blend of style and practicality, Nimble and its amazing design is an ideal for all sorts of purposes and lets you create a really versatile and dynamic theme that makes a statement. 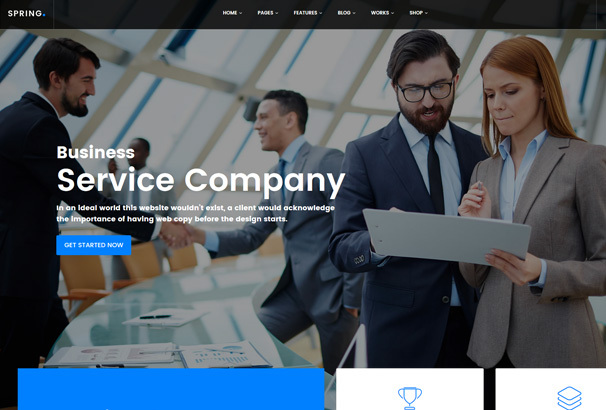 True to its name, Business is a website theme particularly designed for business and corporate use. 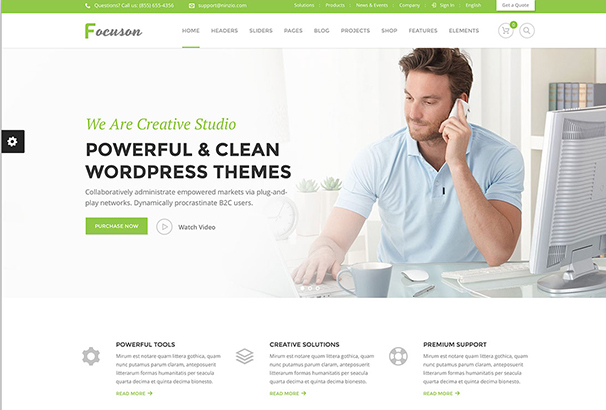 Ideal for Tech businesses, this powerful and bold website theme helps you create a really professional, clean and simple website for yourself. Business comes with e-commerce support and in addition to its amazing custom design, it also allows a lot of room for customization owing to its flexible features. 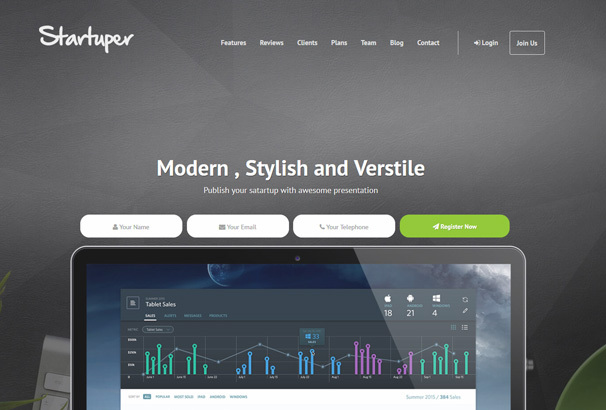 Simply Corp is a really simple and sophisticated website theme that is perfect for professional and corporate use. Its minimal design puts all of the focus on the content which helps you communicate and convey the essence of your company. The subtle-coloured featured boxes on the main page layout let you create a totally professional and corporate environment for your website. 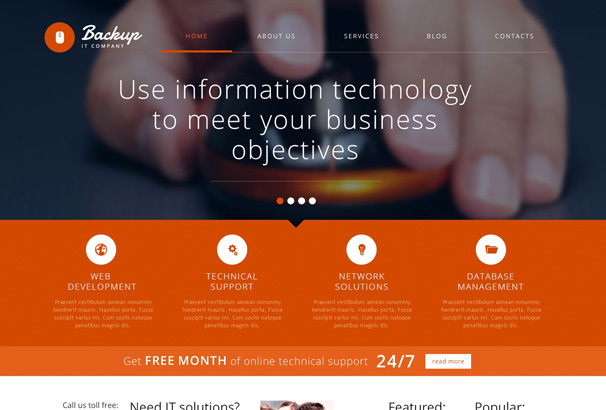 A stunning, responsive One Page WordPress theme excellent for Tech Related Agencies. 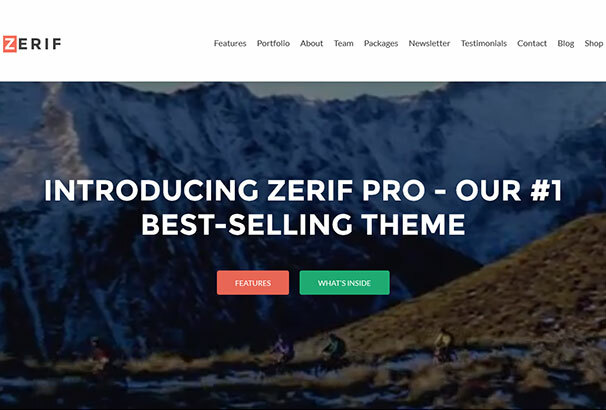 You can use the Zerif to showcase a nice presentation-style homepage for your shop also. Create memorable pages with smooth parallax effect that everyone loves. Upload images into section, put some elements like text, buttons and enjoy a great looking section. 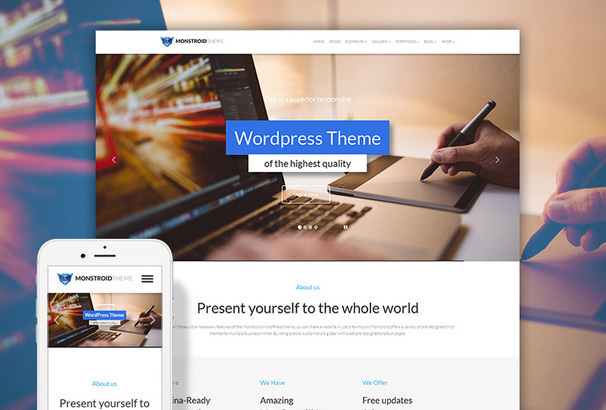 Corporate is a professionally designed WordPress theme that is ideal for IT businesses, agencies, corporations, and freelancers, who are looking to grow their business. Show your experience, portfolio, team members, and services, and help grow client relationships and your company, with Corporate. 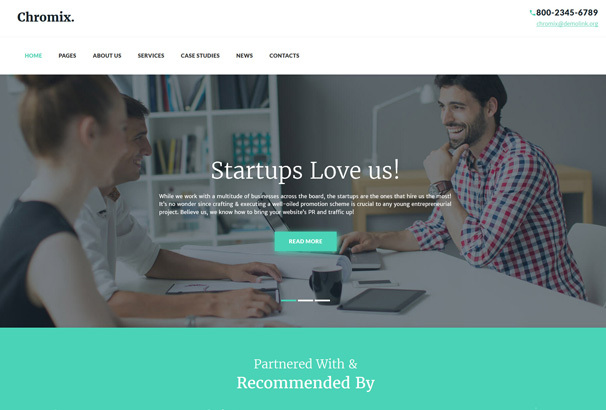 Perself is a really professional and impressive website theme which is especially designed for IT companies and startups. This business theme is really professional in its design, has a really bold font style and overall friendly and appealing vibe. In addition to its design, Persef has a really efficient functionality and has a really good speed as well. Llorix has a really simple and minimal design and layout. For whatever kind of online business you have, Llorix has the perfectly stylish and efficient website in store for you. Not only is Llorix a really elegant and sophisticated website theme, it also runs really smoothly and easily on all sorts of devices ensuring maximum attention and traffic for your website which contributes to added fame and attention for your business. 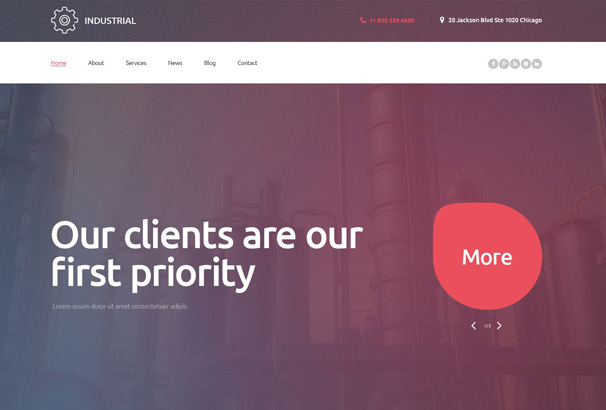 Industrial is a really classy and stylish website theme for all sort of business, professional and industrial use. Particularly designed for IT and tech companies and businesses, Industrial has a really bold and powerful design and layout. This website theme is bound to leave a really strong impact on the viewer. In addition to its design, Industrial is really efficient and practical, perfect for professional use. Monstroid is a really multipurpose and versatile website theme. Its dynamic design is second to none and it comes with a number of pages, a lot of child themes and 23 amazing built-plugins to ensure maximum flexibility, user-satisfaction and customizability. Monstroid has a really memorable and stylish design and layout. Paired with its high speed and efficiency, Monstroid is a great business theme. 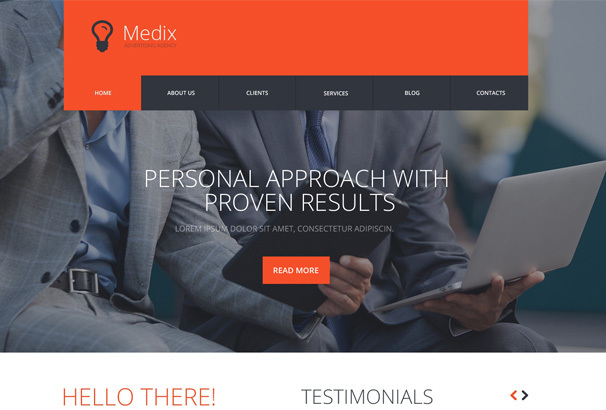 Designed particularly to help you create a really informative and rich website for your company or business, Medix is a really multipurpose and stylish website theme that really makes a statement. For all the businesses and companies that want a certain amount of text on the main page layout and want every viewer to know directly what the company is all about, Medix does just that and more. In addition to that Medix also lets you read about what others think about your business through the feedback option and the theme also comes with social media plugins. 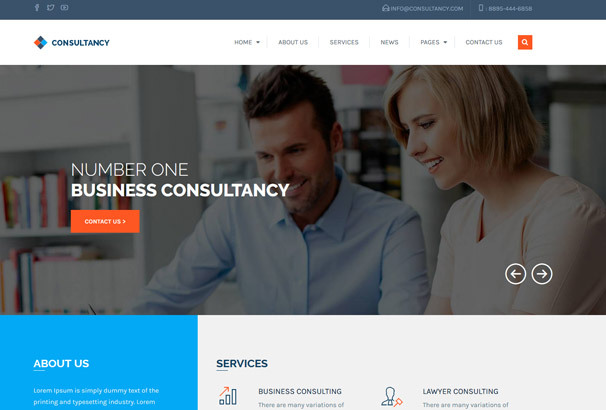 As made obvious from the name, Consultancy is a website theme particularly designed for businesses and for consultancy based businesses in particular. 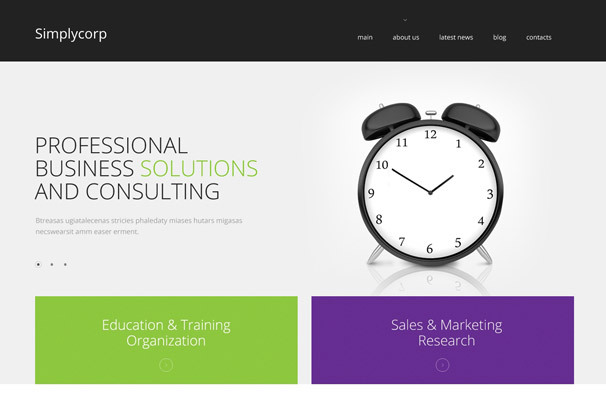 Consultancy is a really subtle and simple WordPress theme that emanates professionalism and simplicity. Its polished design paired with its speed and efficiency makes Consultancy a favourite among business and consultancy based users. Whether you own a social media marketing agency or a company that practically any other sort of business, SEO Company is the ideal theme that fits all content. Its simple and minimal design gives this theme a really professional and attractive vibe. Not only that it comes with a lot of great features and is super easy to use. SEO Company is also SEO optimized as one would assume naturally from the name. For all the people looking for a straightforward yet attractive website theme for their business, SEO Company is the perfect option. 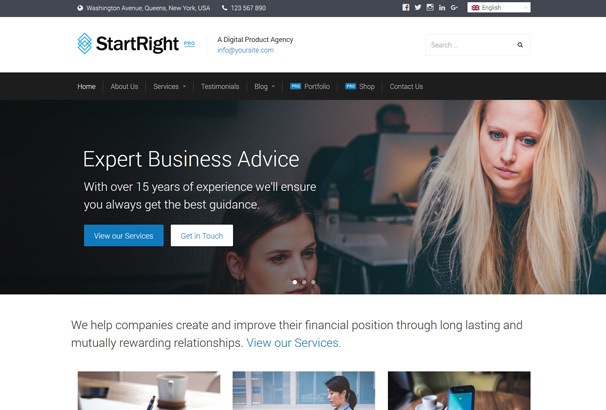 Start Right Pro is a wonderful website theme for businesses and companies. This theme comes mobile ready from the beginning and is really reliable and accessible. Furthermore, this minimal yet creative website theme makes the main focus of the website your business and your work, as it should be with a business website. Start Right Pro is ideal for both startups and already established businesses with its creative design and user-friendliness. 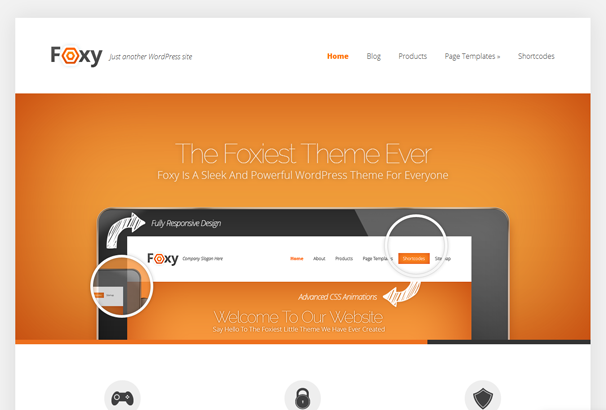 Foxy is a really innovative and stylish website theme for WordPress. Whatever your business is and whatever kind of content you want there to be on your website, Foxy fits pretty much everything. With its e-commerce integration and flexible features, Foxy helps you create a really authentic and ingenious website for your company that is memorable and striking to say the least. 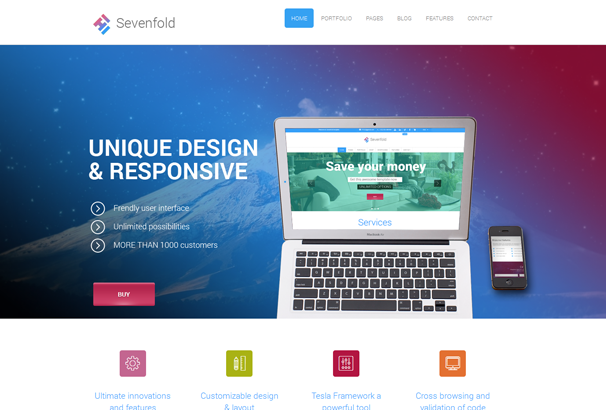 Sevenfold is a highly multipurpose WordPress theme with a really modern and creative design and layout. Sevenfold comes with a revolution slider and also a drag and drop builder which lets you combine elements and create your very own unique and distinct website without having even a little knowledge of code. With its highly responsive design, Sevenfold is ideal for people that value efficiency and practicality. In addition to all that this theme also comes with a variety of options for customization ensuring maximum user-satisfaction. 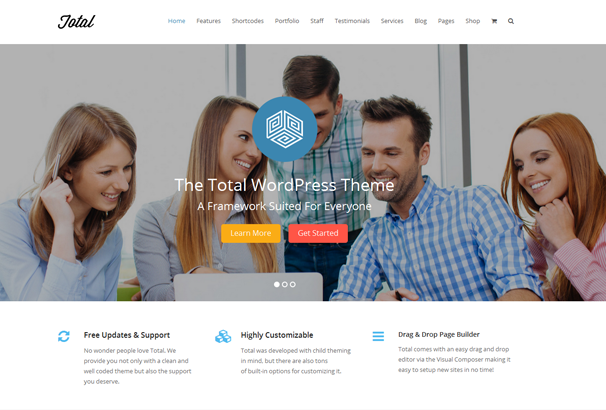 Total is a highly multipurpose and complete website theme that was designed to let you create your very individualistic website without having to do any of the work. Created in a way that it fits pretty much all businesses and professions, Total is ideal for all sorts of professional content. Whether you’re a blogger, wedding planner, lawyer, online store or a nonprofit organization, Total and its impeccable design is bound to work for you. 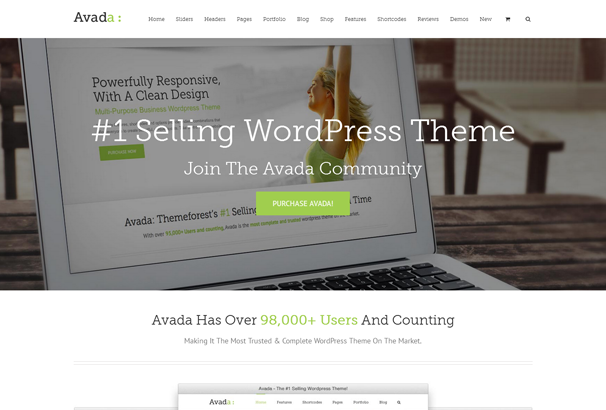 Avada is one of our best and number one selling website themes. It has a really fresh, clean and flexible design which all comes together to create a highly professional and responsive layout. In addition to its elegant design, Avada comes with a lot of features including a fusion page builder as well. Avada is a very multipurpose website theme which has a large number of possibilities when it comes to customization. It also has a great support system and absolutely free lifetime updates regarding new requested features. The7 is a really modern and dynamic website theme. It is SEO optimized and comes with a really responsive, retina ready design which is desired by all. This multipurpose website theme for WordPress is scalable and runs really smoothly on all devices. Its elegant design and fluid functionality is bound to suit your content whether you’re a freelancer or an established business. 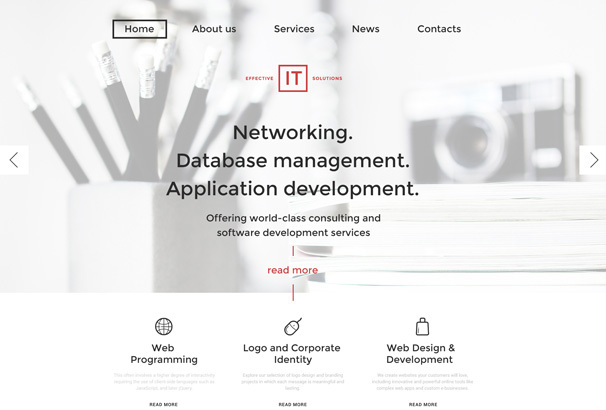 For all the people looking for a really good website theme for an IT company, IT solutions is the perfect option for them. This website theme has a really responsive template which gives the theme a really modern and professional vibe. Built on the amazing Cherry Framework 4, this IT based website theme comes with a variety of options for customization. Using this website you not only get to create a really professional website without having to do any of the work, you also get to colour the website the way you want in virtually no time. 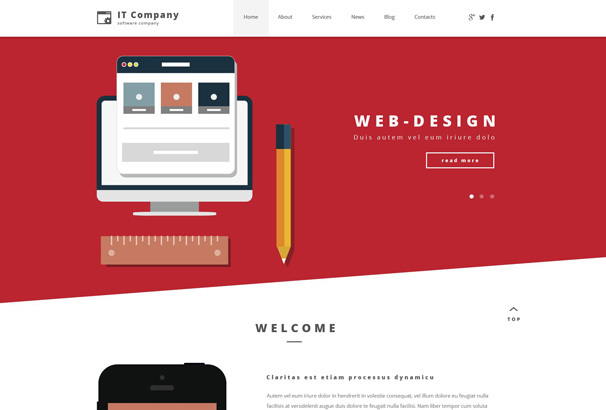 IT Company is another great website themes particularly designed for all sorts of IT businesses and companies. It has a really bold and striking design which gives your website a really memorable and modern vibe. 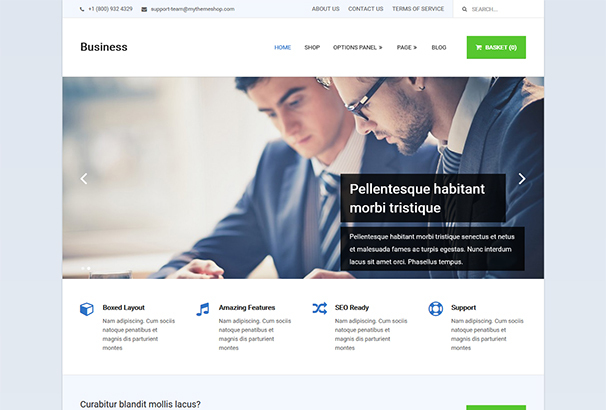 This theme comes with a complete full-width slider, a specific area for quotes and a featured and progress bar using which you can put all the information regarding your business on your website. Using this theme you get to engage the viewers and actually promote your business. As the name suggests, IT Responsive is a really responsive website theme. Using this theme you can create the perfect IT based website for yourself. 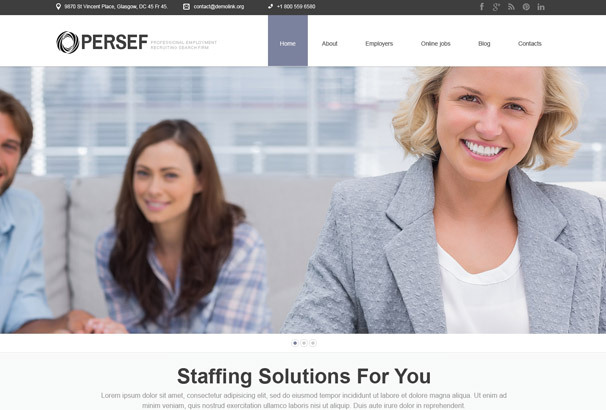 Whether you’re a freelancer or an IT company, this website theme is bound to meet all your needs with its professional design and corporate style. 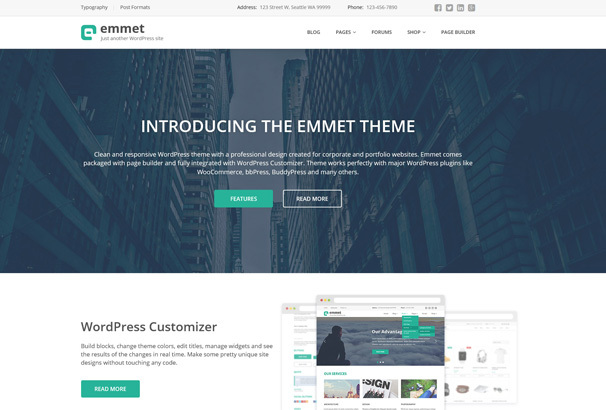 Emmet is a really responsive and professional website theme. A multipurpose theme, Emmet is perfect for corporate or professional use and even for portfolio websites. This bold and dynamic website theme has a really attractive design and comes with a complete WordPress customizer and a page builder as well. Emmet has a really clean layout with its bold typography and header layout. 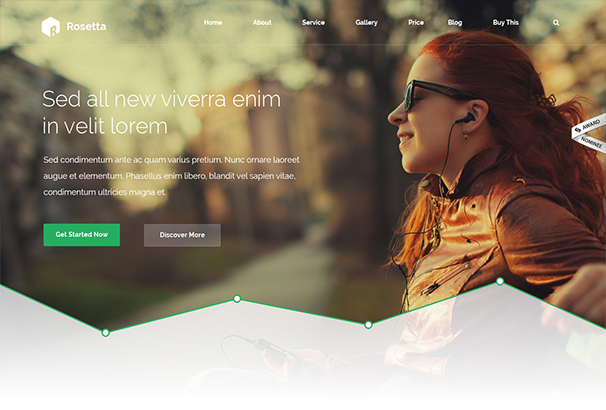 This theme is bound to impress users and viewers. Chromix is one of our best-selling website themes. It has a really clean and simple layout design and is created to ensure professionalism and user-friendliness. With its really subtle colour scheme and corporate style layout, Chromix is ideal for businesses, companies and agencies. 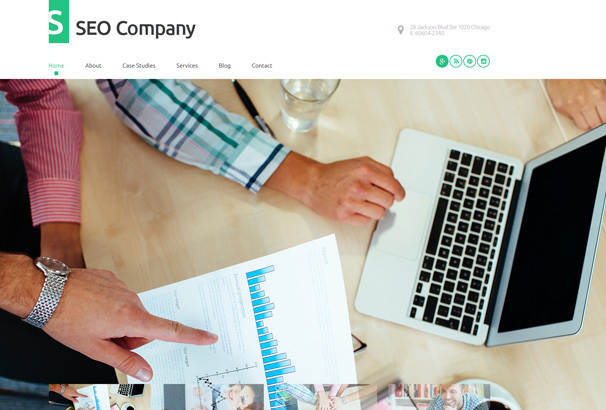 Whatever your company is about, you are bound to benefit from this elegant website theme. 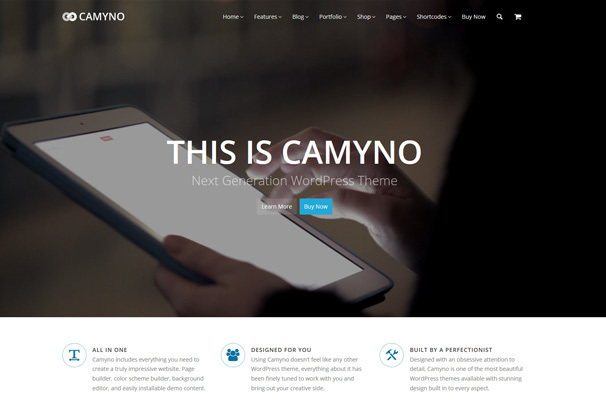 Camyno is a really smart and modern website theme. Designed to ensure the best user experience, Camyno has a really contemporary and mellow layout and design. In addition to that Camyno has a really intuitive smart design that provides the ultimate website experience. Whether you’re a pro on WordPress or only a beginner, you will definitely love Camyno and is cool design. Using this theme you can also create your very own online store. This dynamic theme will suit your needs whether you need it for a blog, portfolio or an online store. 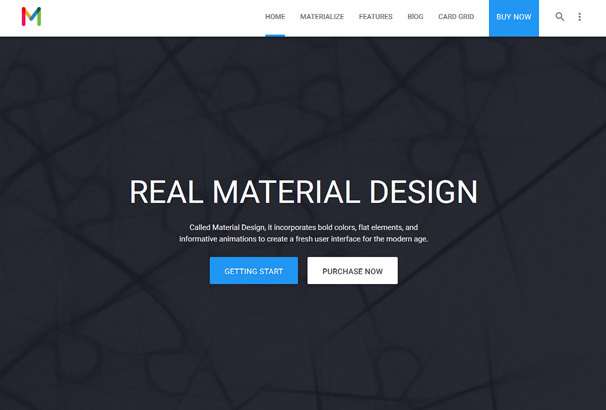 True to its name, Materialize is the real deal when it comes to material designs. Created to give the ultimate easy and efficiency in use, Materialize is known for its speed and smooth functioning. In addition to its speed in functionality, this theme also comes with a super advanced page builder containing 35 elements. It also has an additional eight elements and provides more than 20 pre-built amazing layouts. Materialize is truly the complete package for your website. 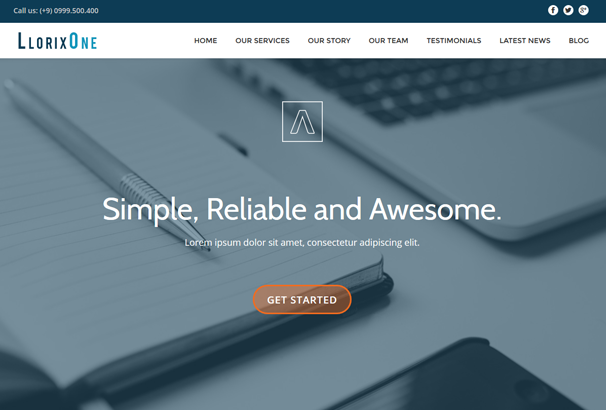 Flatiron is a really contemporary and easy to use website theme. It has a simple and stylish main page layout. Created to give maximum ease and efficiency, this theme comes with built-in post designs and templates. The best thing about this theme is that you can make use of the built in designs without having to deal with any shortcodes or page builders. In addition to all that, with Flatiron you also get to use third party plugins ensuring maximum user satisfaction. Spring is a great website theme with a wonderful and professional design. It comes with bold typography and strong imagery making it perfect for professional and corporate use. Despite everything, the highlight for theme is the fact that it has more than amazing speed. With a test score of 92/100 on Google PageSpeed Tools and a PageSpeed score of 98% on GTMetrix, Spring is one of the fastest WordPress themes ever. 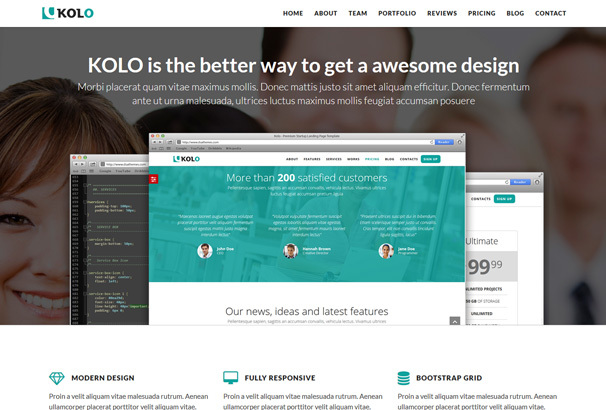 Kolo is a really modern and contemporary theme that comes with a startup landing page. Particularly designed for marketing websites, Kolo has a really smart and structured design that gives space to imagery and text for information as well. In addition to its custom design, using Kolo you can even create a landing page of your own choice within minutes. Kolo is ideal whether you are promoting web services or launching startups. This powerful and contemporary WordPress theme is a favourite among all professional minimalists. With its smart and clean design, Evolve is a multipurpose website theme perfect for portfolios, corporate sites, blogs or even e-commerce sites. Built using the CSS3 and HTML5 technologies according to the WordPress coding standards, Evolve has a really strong and bold layout that runs really smoothly on all devices whether its a tablet or a mobile phone. 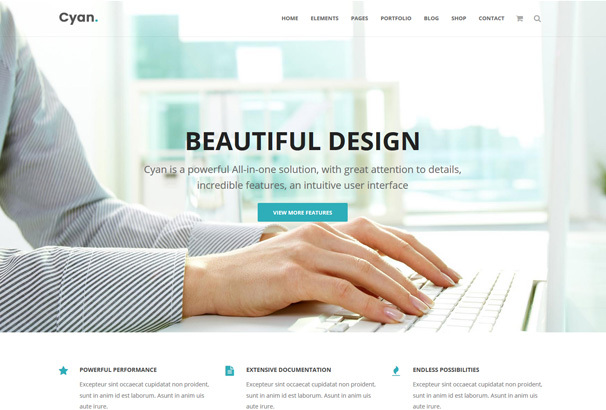 A multipurpose website theme, Cyan has a really contemporary and smart website theme which is ideal for creating all sorts of professional websites. This theme comes with exquisite detailing and wonderful features. Not only that Cyan has a really smart and intuitive interface. Without having to do any of the work, using this theme you get to create a really amazing website theme within minutes. 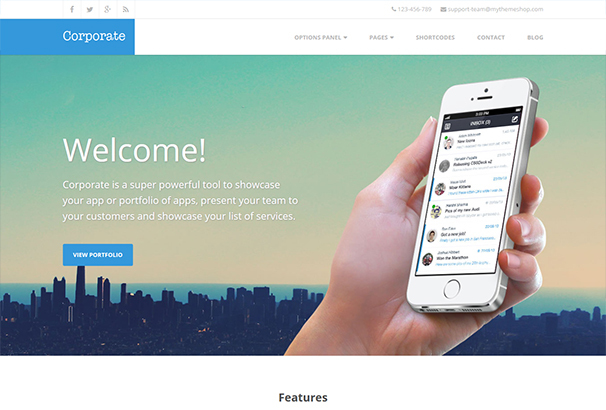 This smart and interactive website theme is particularly designed for startups. It has a really amazing app and software centred theme and helps create a really contemporary and intuitive website for startups in the minimum possible time. This contemporary website theme is versatile and dynamic and gives a really amazing user experience. One of the best themes for business and professional use, Linstar is a really responsive multipurpose website theme which has an impeccably clean and orderly layout. Its simple colour scheme and fresh imagery makes this theme a really elegant option for all minimalists out there. This theme runs really efficiently on all devices. In addition to that it comes with a variety of customizable features. With its UX/UI coding, great slideshows and unique colour variations, Linstar is amazing for all kinds of use. 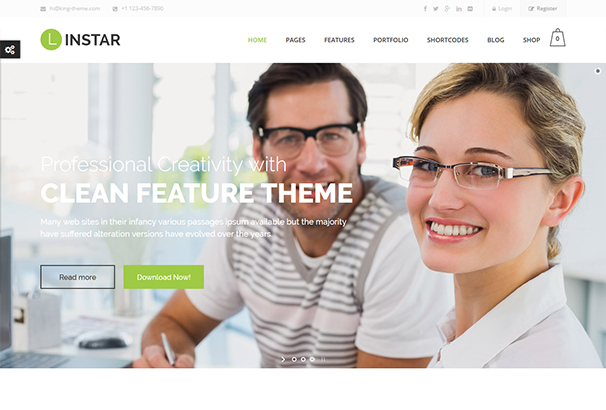 Designed by an elite author, Linstar is a highly professional and versatile theme. 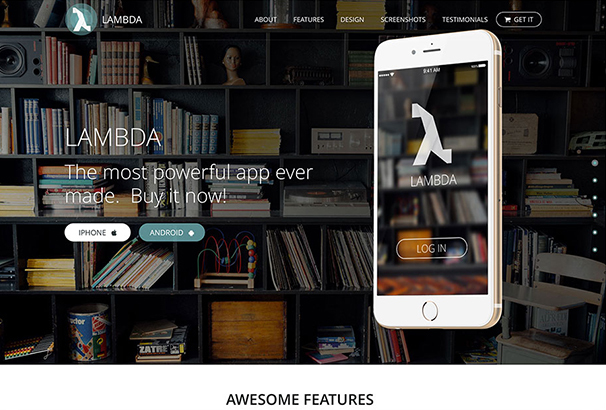 Lambda is a really powerful and dynamic bootstrap theme. 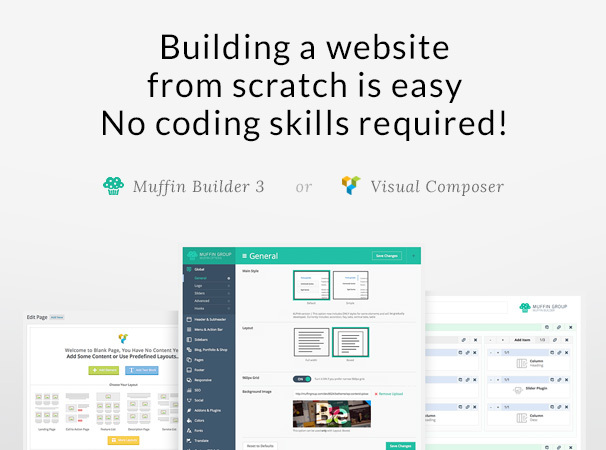 This multipurpose website theme allows you to build your own website however you want. Not only its amazing custom design, Lambda also comes with forty amazing demo sites which can be installed as quick as a single click. It takes only as long as the installation process to create an amazing and efficient website. Armada is a really amazing and diverse website theme. This multipurpose website theme is ideal for pretty much all purposes. 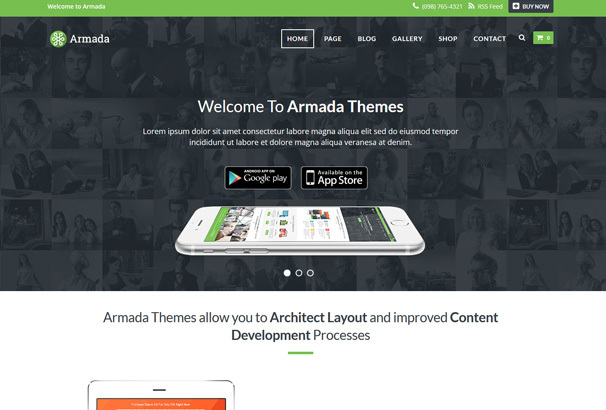 Whether you are a web designer, a business or company, a freelancer or you simply want a portfolio website, Armada is just the thing for you. This website theme has a really versatile design that fits all sorts of content and the theme has a really fast speed as well. 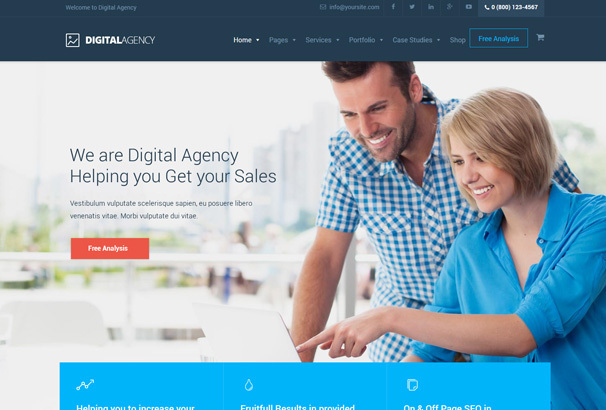 Built on the amazing Bootstrap 3 framework, Digital Agency is a website theme that comes with a lot of amazing features. This powerful website theme is really user-friendly, is SEO optimized and is perfect for all sorts of company and business use. The custom layouts and features for this website theme are really amazing but due to the room for customizability, you can put your own spin on your website and make it all yours. 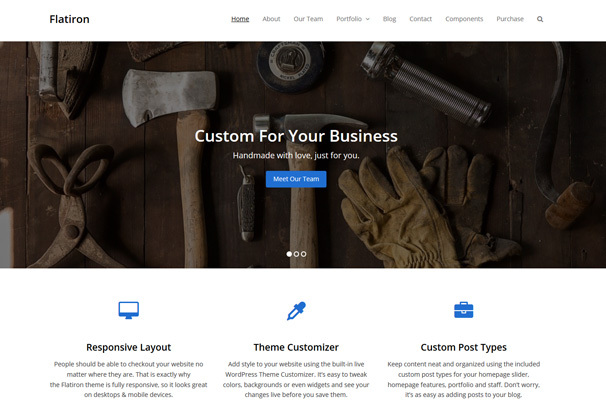 BeTheme is one of the best website themes that we have ever created in terms of design and functionality both. With this theme you get fifteen amazing thematic websites so you can pick and choose whichever website you think suits you best. With its amazing and advanced options panel and the drag and drop builder, BeTheme lets you create a really individualistic and efficient website for your business without having any skills of code. 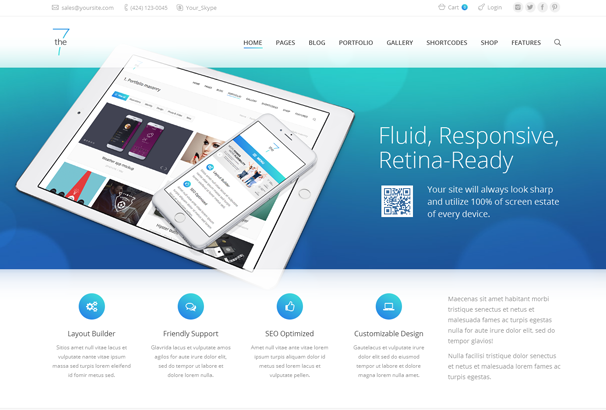 This responsive and retina ready website theme with a really modern and simple layout. Focuson is a really powerful theme that not only comes with amazing custom features, it also lets you customize your website the way you want. This business WordPress theme is ideal for all sorts of businesses. Its powerful drag and drop builder tool paired with the amazing demo data helps you create the website you desire within minutes. This highly professional and simplistic website theme was created with a lot of hard work that shows in the features and the layout. A multipurpose website theme, Rosetta has a really chic and contemporary design. Ideal for marketing companies, portfolios, and promotion agencies, Rosetta has a really amazing template built on the powerful Bootstrap framework. With its modern technology and stylish design, Rosetta is perfect for all businesses that prefer a bit of style and creativity.